The air has not quite cooled off in New York City… and yet, we found our beautiful patch of shade a couple weekends back at Maria Hernandez Park in Brooklyn, settled in, and hosted a bustling rotation of kiddos for the August rendition of Picnic de Palabras. Wet from playing in the park’s fountain, some readers brought over their towels and set up their own “mats” next to ours, bringing books to their spaces and extending our footprint. Others, as was the case last time, too, carried books – as if checking them out from the library themselves – to their families’ areas, reading there and coming back multiple times for fresh stories. We had some wonderful picture books this Picnic, with the breadth of children’s literature expanded by having a larger crew pick books from the library this month. That’s a diversity we’re hoping to maintain – the more perspectives we can bring to the library/Picnic blanket, the better! It was encouraging, too, to see some kids reach for more challenging books, as we had some early reader chapter options alongside the usual elementary-aged books. 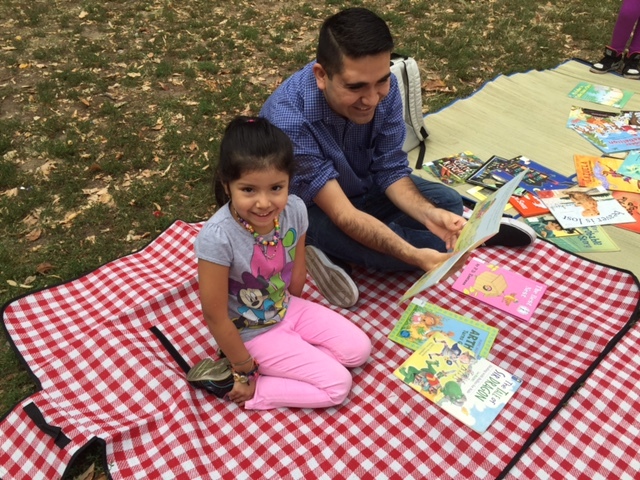 There were fresh faces all around (readers and park goers)… and we’re thinking next Picnic might call for some new blankets, as attention to the program has grown since last month! We anticipate wonderful fall weather moving into September – always a great sign to populate the Bushwick park where we lay our books. Till then! Working up to June’s edition of Picnic de Palabras, we were anticipating grueling heat, and were unsure of how that would affect our audience at the park. Luckily, the day was absolutely beautiful, the park was crowded, and the shade was ample. This was the first time in the Brooklyn Picnic’s short history that there were more volunteers than there were readers, making for a funny demography on the picnic blankets. That didn’t deter the kiddos from coming around — as usual, there were cousins in pairs, some solo readers, parents and little ones, and whole families who joined us to read. There was even an avid reader who brought his furry friend to the picnic blankets: Pancho, the (reading) rabbit! One newly observed relationship to the program was that some shyer children were hesitant to come over and read with/to us, but asked to carry books with them to read in their own spaces. Like a mini library in the park, a few kiddos would bring books back to their own blankets, read them, and return to choose another once they were done. This month, we incorporated books for children whose stories were entwined with writers of classic literature: Zora Neale Hurston-curated short stories, a Virginia Woolf parody, an MLK speech transcribed for kids; we also included books in Cantonese, along with those in Spanish and English, as we’ve noticed the breadth of bilingualism in the park is expanded beyond just Spanish- and English-speakers. The culturally rich neighborhood of Bushwick again proved itself a wonderful host for our Picnic de Palabras. This month we were lucky that Yaco of Picnic de Palabras Bogotá was visiting! Upcoming in August, Picnic de Palabras Brooklyn will host Mary Murphy Wong, a longtime New York resident and storyteller. 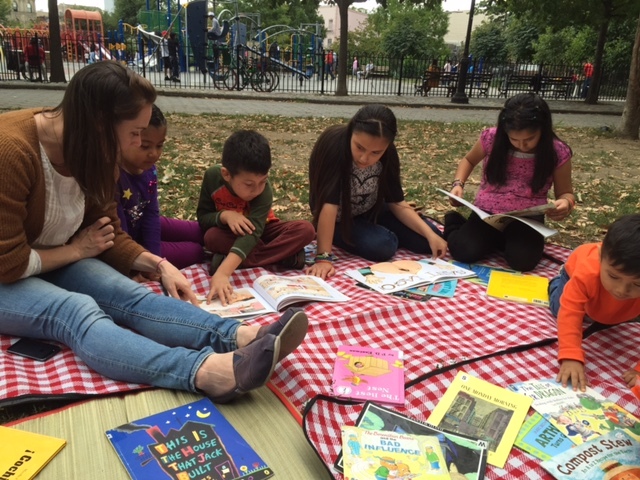 On a cold November day, post-American Thanksgiving feasts, kiddos and parents congregated around the checkered blankets held heavy with libros at Bushwick’s Maria Hernandez Park in Brooklyn, New York City. The month before last in NYC it was chilly – there was a brisk wind and a group of bundled up kiddos to match. This month, the weekend after Thanksgiving, the playground and park were a bit more vacant than usual. Despite the sunshine, it was very cold, and daylight savings time had diminished the hours of daylight in our usual allotted Picnic time. That being said, with a fresh volunteer visiting from the west coast and two alumni helpers, we were able to gather a small crew of loyal readers to the picnic blankets and books. Like Picnics past, the readers were majority English and Spanish speakers, a couple of whom had in fact just arrived to the States from the Dominican Republic a few months before. This was a great opportunity for the kids to get hands-on time with English language books, which, though they could not yet read them themselves, were wonderful centers of engagement as we read them aloud. 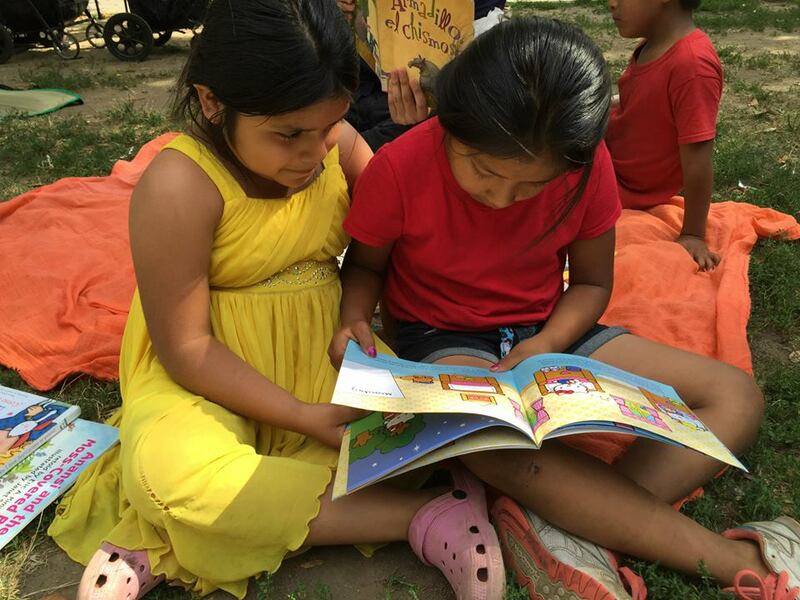 Also encouraging, and something we’re used to having returned to Maria Hernandez Park for a few months now, was the fact that parents were often lead to the reading blankets by the kids, and not the other way around. Once we let people know that the reading program was taking place, children seemed eager to come read, and would bring their siblings and friends along with them. We even had a couple really little ones join us (with their parents) to look through pictures in the books. Unlike other Picnics, we did not have any “repeat customers,” so to speak. We did find that parents and children alike were very interested in the flyers this month, which we distributed liberally, and were curious about what dates upcoming we’d be returning. We also found that this month there were families from outside the Bushwick community, one of who (the aforementioned Dominican family) comes to Bushwick only on Sundays, for church. Though the turnout of readers this month was a little lower than usual, we nonetheless had a productive time in the park, and learned some great lessons about how the frosty weather can affect engagement. This Picnic de Palabras was the first of the brisk fall season – with glorious weather, we were in just as glorious spirits and found the families in the park to be so, as well. Once we set up blankets and lay out the books, though, we found that no one (as we’d been lucky to have experienced before) came running by their own curious volition. So, we set about the park inviting families and kids over. Once a small crew gathered, others joined and there began a nice coming and going of kids and parents. We were encouraged to find that most of the families that came by Picnic were new, having not seen us in the park before, and were excited about the program. We’re hoping to see some of the same faces at the upcoming Picnic. Likewise, we were encouraged to find that not just English- and Spanish-speaking families were coming by the blankets to read (as is usually the case). There were bilingual Asian kids and a bilingual French family, all from the neighborhood. We’re hoping that the upcoming Picnics can continue to see a diverse cultural and ethnic attendance. It was, as it always is, rewarding for the kids (they always want to keep their favorite books!) and for the volunteers (some of whom were new last month). The next Picnic – we await another beautiful, brisk fall day full of children’s literature and community. On Sunday, July 26, we headed out to Maria Hernandez Park in Brooklyn, New York City to launch Picnic Palabras in the United States. There we found sno-cones, fountains, a skate park, a playground, and tons of (unknowingly!) eager kiddos, sated ith sno-cones, but craving a good story. At the beginning o f the summer, we began the search for the perfect park in which to host the U.S.’s first Picnic Palabras. The Brooklyn neighborhood of Bushwick presented us with an indisputably ideal spot — the lively, family-filled Maria Hernandez Park. Having Emilia from the Quito “chapter” of Picnic here in NYC this summer really got the ball rolling, and we’re proud to say that we finally launched the Brooklyn edition of Picnic Palabras this past Sunday, July 26! The reception was incredible. Upon laying down mats and books, a pair of cousins immediately (though timidly) made their way over to check out what was going on. We invited them over, and Cole seemed to have made best friends with them within minutes. Others came over, as usually happens, once the pioneers sat down with books in hand. The crowd of children, which reflected pretty accurately the demographic of the park’s guests as a whole, was almost exclusively Hispanic. From what I gathered, the children were mostly, if not all, bilingual. There were some older kids (pre-teenagers, maybe) and a few preschool aged kiddos, though the majority of stoppers-by were elementary aged. Though we didn’t interact much with parents, we liberally let the readers know that we’d be back in a month. Many of the kids were reticent (which I would consider natural for young kids in new situations) but their appreciation of the event was nonetheless discernible. The most reassuring commentary came from a young boy who asked us how long we would be in the park with the books. When we told him only two hours, he looked up, concerned, and replied, “That’s all?” His discontent with the fleeting “library” was heartening, and spoke to the general enthusiasm for the project that we hope, and which I feel was evidenced, each of the children in attendance had felt.